Two coastal communities ravaged by algae from Lake Okeechobee discharges held simultaneous protests last Wednesday to demand Florida Department of Environmental Protection (FDEP) reject US Sugar's proposed city in the Everglades and send water south. Environmentalists, community activists, elected officials, chamber of commerce officials, Realtors and business owners called upon Governor Rick Scott and his agencies to reject the development and buy US Sugar's land at FDEP offices in Ft. Myers and Ft. Pierce. U.S. Sugar and Hilliard Brother's "Sugar Hill" would create a massive, sprawling city between the Everglades and its water source, Lake Okeechobee. The 67-square-mile project would bring 18,000 new residential units and 25 million square feet of commercial, industrial, office and retail buildings directly into the Everglades Agricultural Area. Click on Sugar Hill MYTH vs. FACT sheet for details. The speakers warned that the massive city planned south of Lake Okeechobee could sabotage efforts to protect the Caloosahatchee and St. Lucie estuaries and to restore the Everglades. It would ensure continued environmental and financial devastation for coastal communities as water from the Lake continues to be released east and west during the rainy season instead of being sent south the Everglades. “The proposed Sugar Hill Sector Plan would impact the State’s ability and contract right to purchase these lands to be used for moving water south from Lake Okeechobee to the Everglades and stopping the destructive discharges to the coastal estuaries,” said Mark Perry, Executive Director of the Florida Oceanographic Society in Stuart. The South Florida Water Management District has an option to buy 48,600 acres of U.S. Sugar land by October 2015. Over 13,000 acres of that land falls within the Sugar Hill city plan. Sewall's Point Commissioner Jacqui Thurlow-Lippisch pointed out the importance of maintaining options for sending water south: "There are many ways of sending the water south. We need to reserve all of these lands for trading and conservation in the future -- and for the kids." Speaking on behalf of the Martin County Conservation Alliance, Maggy Hurchalla, five-term Martin County Commissioner and member of the Everglades Hall of Fame, said, “If [Sugar Hill] is approved, then we are saying as a state that this is what we want to happen. We are committing local, state, and national resources to making it happen. We can't commit to restoring the Everglades and destroying the Everglades at the same time. We need the state to tell the world that Florida's choice will be restoring the Everglades." 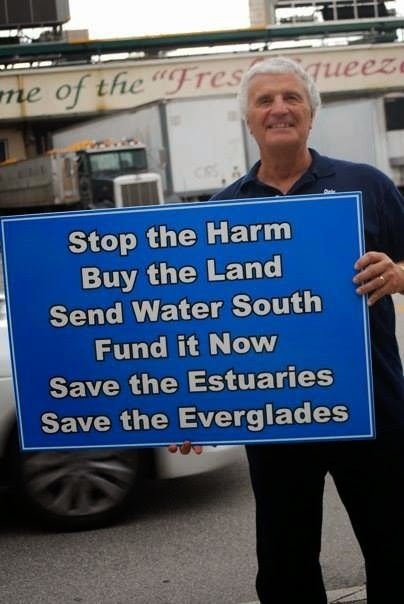 "The Florida Department of Environmental Protection should formally advise the Department of Economic Opportunity to reject the Sector Plan because of its adverse effect on the Florida Everglades and the Caloosahatchee and St. Lucie estuaries, and the flood control, water supply and economic functions they provide to nearly 8 million Floridians,” said Julia Hathaway, organizer for the Sierra Club in West Palm Beach. The River Warriors were out in force in Ft. Pierce and the Solidarity Fish “swam” to both coasts to join the effort. Organizations involved in Ft. Myers and Ft. Pierce included: Sierra Club, Indian River Keeper, Sanibel Captiva Chamber of Commerce, Rivers Coalition, Sanibel Captiva Conservation Foundation, Reef Relief, Treasure Coast Progressive Alliance, Martin County Chapter of the Native Plant Society, River Kidz, Responsible Growth Management Coalition, Inc., and Audubon Society of the Everglades. Do the Right Thing Governor Scott! The Governor’s agencies have the power to stop Sugar Hill and so Rick Scott needs to hear from all of us! If you haven’t sent the Governor a message – send him one now. If you have, then please forward this to a friend! Special thanks go out to Marty Baum, Indian Riverkeeper, for encouraging everyone to come out and for bringing Janine Mason's "Solidarity Fish" artwork. As Marty summed it up: "The only thing that's going to solve our problem -- the enormous volume of water that is being pushed upon us -- is to send it south." For more photos from Ft. Myers (by the News-Press) click here. Watch the Ft. Pierce event at https://www.youtube.com/watch?v=unOPJ2vUbog&feature=youtu.be.